Quoting LrUser24: "Note that the file naming itself (date and time) is absolutely correct! " Seems safe to say Lightroom is using a different source for time when naming the files versus the folders. My WAG: Lightroom uses file-created date for folders and exif info for file-naming, and when camera is emulating disk via USB it reports a different file-created date. I think Lightroom's handling of date-time needs to be "robustified" in this case, and a few others... More specifically to this case: use date-time-original in exif metadata for both folder name and file-name. This particular issue appears to be a variation of the original 'time-zone' bug which occurred in 3.0, but now it only affects date-based folder names when importing directly from camera. File naming is not affected. Caveat: on Win7 64bit, LR3.4.1, Canon 5D MkII, USB2 connection. Other combinations may produce different results, I have not tested, though I think Geoff Walker was going to try with a Nikon/MAC combination. The problem is that in this specific import scenario, Lightroom will ADD the system time-zone UTC offset to the DTO of the files being imported when it determines the destination folder name for the date-based schemes that include DD. For example, if you live in a UTC+12 time-zone, ALL shots taken after mid-day local time with camera also set to local time will produce a folder date of the following day, as +12 is added to the local hour value in the DTO. Apologies, meant to report it when we first came across it a month or so ago. BTW, thought it'd be a good idea to check what happens in a negative UTC zone and found consistent behaviour, i.e. set UTC to -12, local time in camera to before midday, take a picture, and subsequent import folder name shows previous day. I am able to reproduce this problem, and have entered the issue in our bug database. Incidentally, time zone and DST settings on the camera don't seem to make a difference. I also tested with Nikon and had the same problem, so it doesn't seem to be specific to any particular camera. Appears to be a Windows-only bug, I cannot reproduce on Mac. Was this ever fixed? I'm seeing the same behaviour in LR 3.6 (PC / Nikon). Nope, unfortunately not yet. Some day, I hope? In the meantime, you can work around this issue by importing from a card reader, or the hard drive, rather than from the camera directly. It seems that LR4 don't take into account user's time zone when creating folders and sorting pictures during import. My Time Zone is GMT+4. Pictures with DateTime = 28/03 20:07 were placed into 2012-03-29 folder (folder with wrong date). LR4 places some files to a folder with wrong date during import (Time zone related bug). Looks like this bug remains in LR4. It's a big annoyance having to move files after doing an import organized by date. I'm sure it does not take 9 moths to fix. Probably it's sitting at the bottom of the bug tracker. Is anyone actually looking into solving this? This is still happening for me, regardless of how I import. If I import from a card reader, from the camera, or if I copy it to my harddrive first and then import it from there. No matter what, Lightroom uses a date that's 8 hours ahead of me to identify the folder to put the file in, even though the modified date of the file is correct. "No matter what, Lightroom uses a date that's 8 hours ahead of me to identify the folder to put the file in, even though the modified date of the file is correct." These symptoms suggest that the capture time recorded in the photo is off by 8 hours. To verify this, select one of the photos and look at the Capture Time field in the Metadata Panel of Library mode. ...and if the capture time in Metadata is off, that means the clock (or time zone setting) in the camera is off by 8 hours. The capture time in Lightroom is off by 8 hours. But all the settings on the camera are for the correct time zone, and correct time. And this happens not just on one camera, but for all files that I import into lightroom, from all sources, whether its direct from a camera, or direct from the SD card. I have 4 different video cameras that I use, GoPro, Sony, Canon, and iPhone, and they all have this issue. I'm in Pacific Time zone, so it's appearing that Lightroom is using GMT for determining what folder to use (ignoring time zones completely) but using the correct times for everything else. 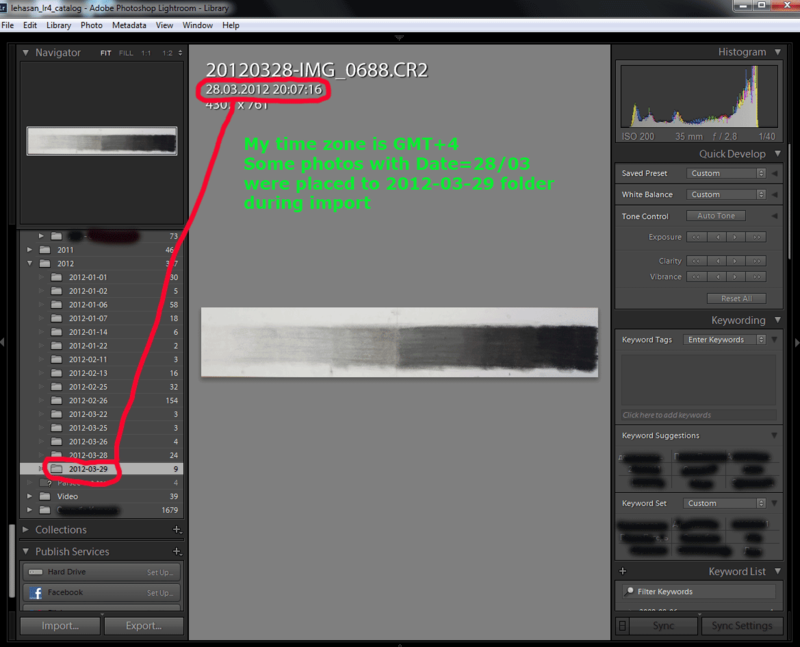 In Lightroom 4, when importing photos directly from camera (USB), LR puts some images into wrong date folder. Seems it doesn't check cameras time settings (timezone and summer time settings). LR4 imports doesn't check camera's time settings and imports into wrong date folderlr4. Just installed LR4.1 release, still seems to be there? Wrong time in renamed filename after import captured video from an iPhone. Unfortunately the filename is exactly 1hour later than the video is captured in meta data. If I import it without rename the file during import and do the rename later (via library --> rename photo) the filename is correct. These bug already exists a few versions earlier in LR3. Lightroom: Wrong time in renamed filename after import captured video from an iPhone.. I have Lightroom 4.1 64bit for Windows installed and experience following issue: When I import the exposures from my Nikon D7000 sometimes the importer splitts the files into two different folders, even though the exposure date is from the same day. I presume that there is a problem with date comparison. I live in the timezone Berlin, Rome, Vienna; the camera shows the correct time (additional info is UTC+1; summertime) and my pc is synchrone. When I import the exposures, all files with time greater 22:00 are put into a folder with exposuredate + 1. It seems as if the importer treats the filedate as plain UTC, adds 1 hour (UTC+1) PLUS adds another hour for summertime. Is this problem already known? Wrong folderdate on import of exposures in Lightroom 4.1. When importing videos from an iPhone into Lightroom 3.6, the "hour" field value included in the filename is different from that of photos.. When I import photos from my digital camera (Sony DSC-RX100) into Lightroom 4, the photos are placed into the wrong date folders. Wrong folder dates during camera import. Is there any other workaround to this problem? It is causing hundreds of duplicates to be added to my collection. I use an iPhone so the workaround of using a card reader is not practical not is the directory as it would require me copying all the files from my camera and probably break duplicate detection. You can still import straight from your iPhone, just don't rename them during the import. Instead, rename them once the import has finished via Library > Rename photo. As mentioned in the comments above, you can work around this issue by importing from a card reader, or the hard drive, rather than from the camera directly. Camera and computer are configured to Australian time zone. Just posting because I would like to keep an eye on this thread. At the risk of reiterating what's already been stated above: consider getting and using a card reader for the interim. Here is one specific problem: I have a Nikon D90, I attached the camera to my computer and select import using LR4.3. The photo to be imported is taken at (Time stamp on camera) 31 Jan 2013, 18:26:45. My camera is set to GMT +11 hrs which is the summer time for the area I'm in (ie the 11 hrs includes daylight saving). When the thumb nail is shown before I hit the import button , if I mouse over the thumbnail, the time is shown as 1 Feb 2013 05:26:46. So 11 hrs and 1 sec more. LR also tells me it will put the import into the 2013/2 folder which it needed to create (todate I only have 2013/1 folders) Then I import using LR to rename the filename using the date time. It does this using the correct date time ie 20130131_18-26-45 but puts the import into the 2013/2 folder. The 11hrs and 1 sec suggests (ie the extra second suggests) it's getting a timestamp from somewhere else and then adding the GMT adjustment. All time fields in the metadata shown in LR4 are all 18:26:45. Lightroom: Problems with Capture time in Lightroom 4. I can confirm that with LR4.3 this issue still occurs. My workaround is that I still import the photos straight from the camera, but without renaming them during the import. Once import is finished, I rename them via Library > Rename photo. UTC is disregarded, as it should and time shows up correctly. It still fails with Lightroom 5 when in the ICT (UTC+7) time zone and pictures are taken in the evening. Well it's Oct. 2013, more than 2 years since this thread was posted (2011-07-21) and in my LR4.4 and LR5 above comment, this issue has still not been resolved. Please don't tell me to add another step to my workflow, (Use a card reader), work out the issue and fix it. If you go to the About tab, there are many Engineers/Managers that have signed off on this product. The shame sits with them if they do not clear the problem tickets before releasing the product. Jingyuan Bai, Simon Chen, Kjetil Drarvik, Julie Kmoch, Brian Kruse, Ying Liu, Peter Merrill, Andrew Rahn, Kevin Tieskoetter, Jianping Wang, Max Wendt, Ben Zibble, Yu Zhao, Qiang Zhu. Eric Chan, Thomas Knoll, Zalman Stern. Kelly Castro, Tony Francesconi, Dan Gerber, Paul Kleczka, Shoji Kumagai, Baichao Li, Xin Lu, Craig Marble, Chuntang Pan, Tomoko Shinji, Mark Soderberg, Becky Sowada, Dan Tull, Jeff Van de Walker, Benjamin Warde, Xiaokang Wu, Xin Wu. Heather Dolan, David Franzen, John Kwon, Adriana Ohlmeyer, Michelle Qi. David Auyeung, Whitney McCleary, Pam Sogge. Pallab Jyotee Hazarika, Benjamin Warde. Rose Lu, Annie Tai, Susie Wang, Lily Wen. Tina Carter, David Metzger, Brett Nemecek, David Baxter, Kaori Oikawa, Mandhir Bhatia. Anita Dennis, Chandra Shekhar Puri, Phyllis Howell, Michael Salinero. Jason Bartell, Rich Gerber, Jamie Gjerde, Eric Hanson, Alan Erickson, Dan McCormick, David McGavran, Brad Pillow, Eric Sanders, Nick Schlott, Nariman Sodeifi. Ranjit Desai, Erik Boe, Jane Bond, Lori Tregoning, Jeff Jiao. Frank Biederich; Alan Lillich; Hartmut Warncke; Joerg Ehrlich; Samy Makki; Stefan Makswit, Thorsten Schneider. Rahul Gupta, Sunil T.M., Shiladitya Bose, Puneet Kumar Garg, Rekha Agarwal. Todd A Burke, David Casey, Mike Houser, Mike Price, Greg Wootton. Diemay Nagase, Carolyn Young, Beverly King, Donna Kennedy, Deb Hancock, Ben Chan, Maria Jeronimo, Carrie Otto, Christopher Moehrke, Irene Smith, Alina Cristina Constantinescu, Stephanie Heng, Yeng Kar Lim, Diana Harwood, Jackie Cameron, Linda Mitchell, Sandra Stoecker, Cecilia Ramos, Ruth Manson, Felicity Alvarez. Shantanu Narayen, David Wadhwani, Winston Hendrickson, Mark Hamburg, Maria Yap, Tom Hogarty, Melissa Itamura, Julie Kmoch, Becky Sowada. I wondered why all these great photographers use Lightroom but never complain about this longstanding bug as they travel the world. Then I realized that it was a Windows only bug and they all use Macs..